What do Mormons believe about the Godhead? Members of the Godhead are united in purpose and will but consist of three separate Beings: God, the Eternal Father; Jesus Christ, His Son, our Redeemer; and the Holy Ghost. This view of the Godhead is based on ancient and modern revelation, and Mormons’ belief in the personal appearance of the Father and the Son to Joseph Smith in 1820. 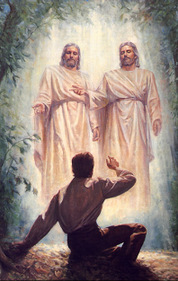 The Latter-day Saint (nicknamed Mormon) understanding of the Godhead and the nature of God are rooted in the prophet Joseph Smith’s first vision in which the Father and the Son appeared to Joseph standing side by side.The two members of the Godhead were clearly two separate, distinct personages.These two with the Holy Ghost, also an individual person of spirit, constitute the Godhead of Father, Son, and Holy Ghost.They are absolutely one in love, will, purpose, and direction.There is no variation among them, and to underline this unity, even though it is not an ontological unity, Latter-day Saints often define the doctrine of the Godhead as “Social Trinitarianism,” thereby underlining the indivisible unity of the three. In Latter-day Saint (Mormon) thinking, however, there is a subordinationism within the Godhead.The Father clothes the intelligences of the Son and Holy Ghost with spirit form and is therefore superior to them.He gives directions which they carry out in total unity and unanimity with Him.Each of the three is God, but the Father reigns supreme, and as it says in I Cor. 15:24 after subordinating all things to himself, in the end the Son will deliver all things to the Father and then subject himself fully to the Father, in order that the Father may reign over all. As is clear, members of The Church of Jesus Christ of Latter-day Saints (errantly called by the media The Mormon Church) do not subscribe to the traditional doctrine of the Trinity as defined at Nicaea in 325 C.E.The Latter-day Saint doctrine is not derived from an interpretation of scripture or from neo-Platonic philosophy, but rather from the first vision.It is the Latter-day Saint conviction that the traditional doctrine of the Trinity cannot be found or defended from the Old and New Testaments, but rather that it is an unnecessaryphilosophical addition to biblical doctrine, trying to answer a question that does not need answering.That question is how there can be one God in the Old Testament, and yet three persons who receive divine ascription in the New?The Nicene answer is that there are three simultaneously, co-existent persons–Father, Son, and Holy Ghost–in the Godhead, and to retain the Old Testament one God, they must be of “one essence” or “one nature.”Any competent Protestant or Catholic theologian will, however, say that this is THE mystery of God and is not fully comprehensible. Latter-day Saints (Mormons) do not see such a problem, because they believe that in the New Testament something new about God is learned.The one who is made known in the Old Testament as God, YHWH or Jehovah, has become incarnate as Jesus, and from him we learn that there is not just one God, but a Godhead composed of three simultaneously, co-existing persons–Father, Son, and Holy Ghost–who are one in all aspects save nature, and who together compose a Social Trinity. Joseph B. Wirthlin, Ensign, Nov. 1991, 15-17 One distinctive principle [of the gospel] is a true concept of the nature of the Godhead. John H. Vandenberg, Ensign, May 1974, 11-13 There is no question that Jesus taught the very nature of God the Father, God the Son, and God the Holy Ghost-three personages of form and substance, individual and distinct.